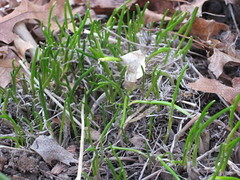 Tender, new chives, March 2009. Are you kicking yourself for neglecting to clear out the debris from your gardens before winter settled in? Me, too. But before you throw your hands up and wish you had dedicated more time to sweeping those beds clear, consider this: you’ve probably done your plants a big favor. The warmth of the leaves does a lot to insulate the roots from winter damage. Plus, the decaying organic matter infuses the ground with nutrients. Life ususally gets in the way of my best intentions for clearing the gardens. But as I was pulling the dead stalks in today’s 50-degrees and sunshine, I noticed more signs of life beneath the leaves. Delicate shoots were reaching through the dirt. And while it’s tempting to clear the leaves and give things room to grow, I’m not willing to give the all clear. The nights around here are still cold, dipping into the high twenties. And even though we’ve had several days reaching into the 50s, a frost could still kill these tiny plants. If you’re feeling bad about being lazy in the fall, take heart! It really was a smart move.